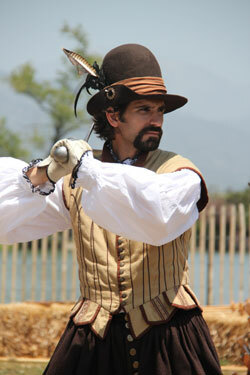 Historically, Gentlemen Adventurers were the second and third sons of nobility, knights and land-owning gentry. Through the tradition of primogeniture, the first born sons generally gained the titles, lands and the family business upon the death of their father, whilst the second and subsequent sons were left to gain honor and glory for themselves. The most common way for these young gentlemen to move up in the world was to attach themselves to an army or naval unit. Because of their high birth, they were gentleman, not common soldiers and were frequently given command of units during a campaign. Additionally, the common soldiers would look to them for guidance if the leaders were fallen. It was believed that noble birth naturally granted the ability to lead. These were the men who gained knighthoods and glory from being involved in military actions. They were the patriots, heros and soldiers of fortune of the 16th century. 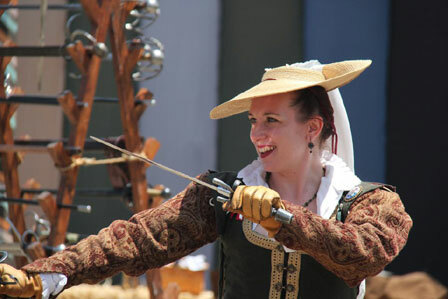 The Gentlemen Adventurers specialize in portraying Army and Navy military officers in the service of Queen Elizabeth I. These were the men responsible for establishing England's first colonies, the exploration of the New World and heading England's interests in military matters. These were men of money, education and fortitude. 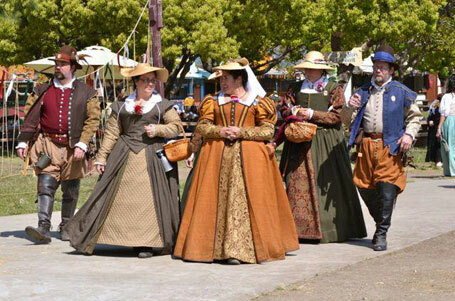 The ladies of the Gentlemen Adventurers portray the educated women of the emerging 'middle class' and frequently came from well-to-do families of the Elizabethan period. Whether they are dancing, spending their husband's money at the markets or training alongside our gentlemen, they were the backbone to all the gentlemen of the era.